Joe LaRochelle’s ’55 Chevy, just like Mom used to drive. “Today your grandma would’ve been 96,” I said to my son Bill, who happened to be home for a visit July 3. “No,” I said, without really thinking about it one way or the other. My mother will be gone 10 years in October. I have gotten used to not having her around, even though hardly a day goes by that I don’t think about what her advice might be on any number of life’s questions I’m left to internalize. The rest of my day was typical – mostly work, some tidying up. At some point I realized that, with a Friday bank holiday, it might be a good idea to go get some euros for our upcoming international vacation. It was getting late – around 4 p.m. The downtown Citizen’s bank has a convenient parking garage, which is usually pretty well occupied. But being the Thursday before a holiday at 4 p.m., I had my pick of parking spots. I turned into one of the first spots I saw on the ground level. As I got out of my car I thought to myself that I needed to go up one level to get to the bank. There are stairs in the center of the garage, but I had parked near the ramp that goes up to the next level, so I just decided to walk up the ramp. I should add that, in reality, I didn’t need to go up one level. I know this, but for some reason, my head told me otherwise. Or maybe it was my heart. 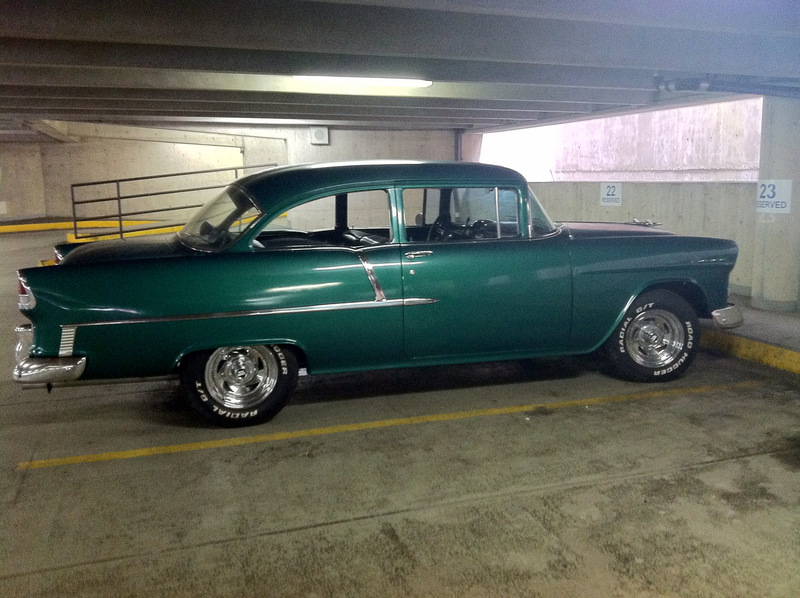 As I rounded the corner I saw a green ’55 Chevy parked right in front of me. It was pretty much the only vehicle on that level. Had I not made a mistake about where I needed to go and walked up the ramp, I wouldn’t have seen it. Without thinking about it one way or the other, I started to cry. 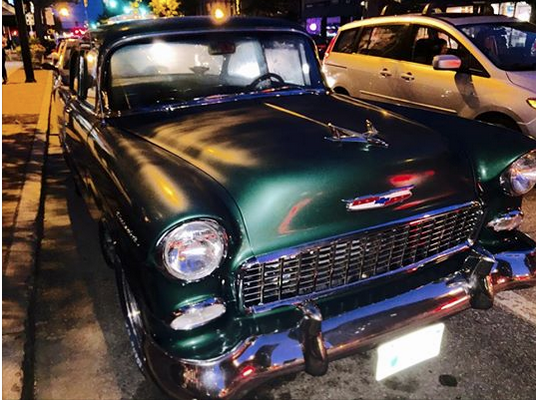 Sad because my mother purchased her green 1955 Chevy new, and it was for my entire life synonymous with her – even after she sold it in the early 1990s. Everyone knew my mom by her car. I have seen ’55 Chevys from time to time out in the world, but usually at car shows and rarely painted in that familiar shade of green. I walked over to the car and snapped a few photos – the hood ornament that looks like a minimalist silver airplane, the pointy tail lights, the silhouette that struck me at that particular moment as a green ghost of my childhood. The windows were rolled down, so I moved close enough to see if the interior details were as I remembered them. They were, only this car looked like new, inside and out, with the exception of a little rust on the rear bumper. I took it all in for what seemed like way more than the two or three minutes it was in real time. I walked down the stairs and did my banking, and almost didn’t go back upstairs to see if the car was still there when I was finished. But I needed to see it one more time. I had the presence of mind to leave a note for the car’s owner under the windshield wiper, explaining how seeing that car on my mother’s 96th birthday was a special gift. I thanked him for being there. Several hours later my phone rang. It was Joe LaRochelle, who identified himself as the owner of the car. “Wanna drive it on your mom’s birthday?” he asked right away. “No. No, thank you – it’s pretty late,” I said, without looking at the clock – which I later noticed hadn’t quite reached 9 p.m. on the digital display. Joe told me that he bought the car in 1982, only the second car he’d ever purchased in his life. He drives it all the time. “I used to live in Manchester but I moved to Maine – I’m actually just here visiting my brother,” he told me. “So, finding your car in Manchester on my mother’s birthday was really pretty random,” I said, matter-of-factly. Joe and I talked a little more about his love of vintage cars. “The only difference is that my mom’s car had a white top. I guess all the ’55 Chevys were mostly painted green, huh?” I said. “No, they came in 100 different color combinations,” said Joe. I took down his number, and the address of his brother’s shop over on Massabesic Street, Jon’s Shafts & Stuff, in case I ever need a shaft, or other car related stuff. I hung up the phone, half regretting not taking Joe up on the offer to go for a spin in the old ’55. But as I internalized it all, I think my gut reaction came from the same place as my urge to walk up the parking garage ramp. Sometimes in life we need an affirmation that everything is OK. Or that everything that isn’t OK, will be. Sometimes it’s just enough to be reminded that as random and disconnected as life can seem at times, it’s really not. Life means everything, even if we don’t always understand why we’re here, or where we’re heading. We just need to follow our heart and trust our gut, and look for the signs that help move us in the right direction when we need it most. Postscript: July 3, 2015 – Tonight, while walking in downtown Manchester heading for the day-early fireworks, my husband pointed to this car parked on Elm Street. “Just like your mom’s!” he said, and sure enough, there it was, for the second consecutive year, a ’55 Chevy.